Three techniques guaranteed to help achieve group project bliss. In an ideal world, a digital project should act like a campfire; a central point of interest that draws together experts, practitioners and stakeholders. But when you’re trying to achieve this across an ever-shifting team, how might you maintain that shared sense of focus? Here are some top techniques to try. Every project participant comes to the table (even if it is a virtual one) with a different lens; a different perspective on a subject, which means they have a different language from you. 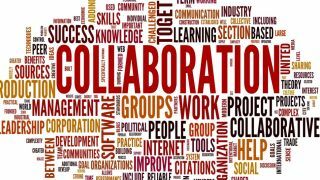 If you’ve ever sat at a boardroom table listening to a conversation and thought “I don’t understand what these people are talking about” then you’ve experienced one of the main blockers to creating a fruitful collaboration, which is not having a shared language. The more diverse your group members are, both culturally, physically, mentally, and in terms of their domains of expertise, the more potential you have to innovate and create something no-one has ever seen before. But it requires acknowledging that time and effort need to go into the language you’re using. As part of my work at Clearleft, I recently facilitated a workshop with 16 Artificial Intelligence experts from all over the world. In order to create divergence in the conversation and reflect the diversity in the group, I ran a “vocabulary dump”. Every individual took 15 minutes to write out all the words they could think of from their domain on sticky notes. We stuck them together randomly in a cloud, covering several metres of window space. We then used our huge vocabulary cloud to act as a starting point for discussion, allowing people to question what one another’s phrases meant, and also pick up on nuances in meaning. It was a wonderfully collaborative way to spark helpful discussion and identify where there was convergence and divergence in our vocabularies. A few organisations we work with are now using the evocative term “North Star”. It’s a short central organising statement in the form of a proposition or an elevator pitch. The act of composing this short North Star statement with everyone on your project is a surprisingly challenging exercise in collaboration, but the major benefit of the work is that it draws the team together in order to iron out inconsistencies in everyone’s perception of what they’re doing. It’s not copywriting or marketing language, it’s just a plain language statement that shows the team have consensus around what it is they are creating together. One way to gather these guidelines is by asking your team members to contribute stories that begin “I liked it when…” or “I like the way…” about other brands, work experiences, or about your working culture. The act of doing this is in itself a positive experience that focuses the team on the act of collaboration. Get your tickets to Donna Lichaw's talk at Generate now! Donna Lichaw guides startups, non-profits, and global brands in optimising their digital products and services by providing them with a simplified way to drive user engagement. In her talk at Generate New York from 25-27 April 2018 she will reveal while many of us seek out the newest and shiniest tools, methods, and processes to build more successful websites, apps, products and services, we often overlook one of the oldest, leanest, most effective tools out there: the structurally sound story. Whether you realise it or not in the moment, you experience everything as if it was a story. The better the story, the more likely you are to want to use a product, continue to use it, pay to use it, and recommend it to others.